← Obergefell: Equal Protection and Due Process Convergence? 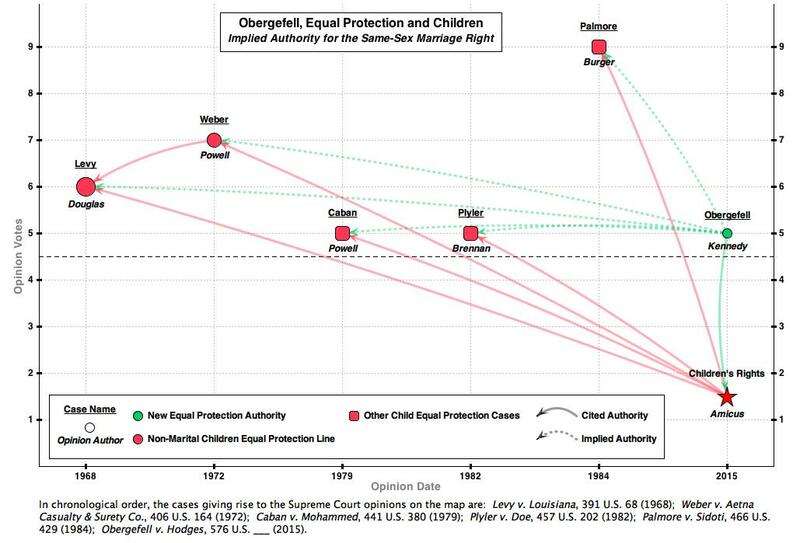 Obergefell: Equal Protection for Children? Last week on this forum, I mapped out a line of Supreme Court equal protection cases know as the non-marital children cases. These cases were featured in a key amicus brief submitted by the Scholars of the Consitutional Rights of Children in the Obergefell litigation. Although Justice Kennedy did cite that amicus brief in his majority opinion, he notably failed to cite any of the underlying non-marital children cases. Nonetheless, I wonder whether it would be fair to characterize Obergefell as — among other things — a case about equal protection for children. The map above puts this question in visual form by displaying the five main cases discussed in the amicus brief — Palmore, Plyer, Caban, Weber, and Levy. Comparing the equal protection analysis in these cases to that offered by Kennedy in Obergefell is potentially instructive. Readers interested in doing this can do so by (a) clicking on the image above to open a full-sized map with links to underlying opinions; and/or (b) clicking here to open an identical map with links to Supreme Court Database information about the cases.